Moving day was full of wind, rain, and flying November leaves. The day was made even drearier since my ham radio antenna (a used Gap Titan DX vertical) along with lawn furniture and a ladder were all stolen the day before. Seven months later it was finally time to put up a new antenna and the Gap Titan DX was once again the choice. My old one had served me well for many years and it was a used antenna when I got it. A new Gap couldn’t help but perform as well or better than the old one. I placed my order with hamcity in California. The drop shipped package arrived in only one week; I barely had time to think about the planning of a mount for it! I can highly recommend hamcity – they had the best price and superior individual customer service. After deciding on the location (ground mounted, some 20 feet from the house … a bit close but out of the way) the next big decision was the mounting procedure. Gap sells a nice mount made of aluminum. It runs about $100 with shipping and it goes two feet into the ground. It can be used with or without cement; personally I would use cement. I looked at a couple mounts from other companies too. They all had the main feature I was looking for, the ability to tilt over. Some of them needed to be used in such a way that their own length would add to the length of the Gap, something I did not want. That would only complicate the tuning. I did not get the Gap tilt mount because it only went two feet deep and could never come out. I didn’t like putting nearly $100 worth of equipment into a hole. So, I went to see my friend Bill, KB1CWE. He has about 5 different vertical antennas of varying dimensions ground-mounted around his house. He made all of his own mounts. He used a flagpole-like configuration. Each of his mounts consisted of two steel poles flanking a central steel mast upon which the antenna was mounted. He never uses any guy wires because they are not needed. His mounts are massive devices that only the most severe hurricane could possibly threaten. All of his materials were scrounged from leftovers from his days as a machinist. Everything Bill makes is extra heavy duty and has the appearance of the craftsman’s touch. These mounts were no exception. I decided that I needed to copy his general design but that it would have to be something more in tune with my lesser skills and materials. It’s tough to build to a standard set by someone who is in his 90’s (Bill). My next stop on the planning trail was to the Gap Antenna discussion group on Yahoo. There I found a really neat design offered up as a pencil sketch (and long distance photo) by Mike (WB9L). 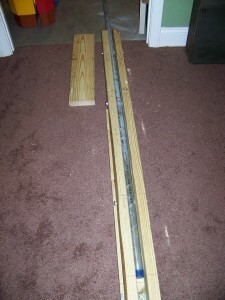 His choice of materials was pressure treated lumber and standard 1-1/4” OD steel pipe (the type required by the Gap vertical for proper mounting). I liked his design so much that I used it with only slight modifications. I tend to purchase materials in waves. I’ll go to the Home Depot or Lowes and get some of the parts and then return another day for more. I never seem to enter with a complete list. 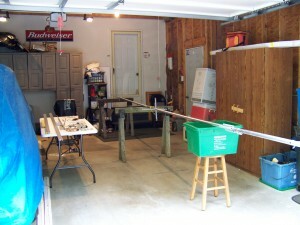 The first item on my list was a 10 foot steel pole. I found a nice 1-1/4 section and took that home. Then I tried to attach the Gap insulators around it. That is when I found that I had purchased a 1-1/4” ID (inside diameter) pipe rather than 1-1/4” OD pipe. Trip number two was a couple days later. I got the right pipe (it cost about $10 less), a couple 8’ two by fours and one 8’ two by six. I also purchased several 3/8” galvanized stove bolts and matching wing nuts and washers. I knew that the difficult part was going to be drilling those holes through the pipe. How do you make the pipe immobile while drilling and how do you make sure that all the holes (3 of them) are properly lined up with each other? 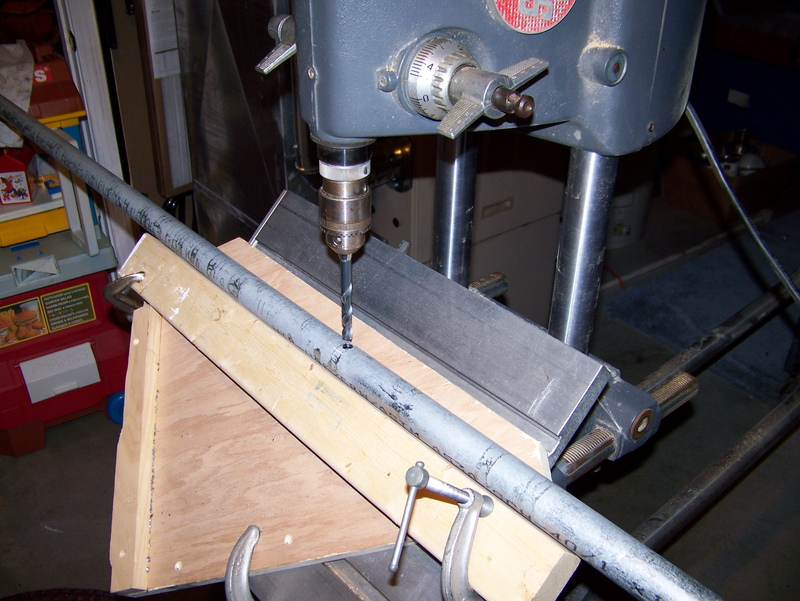 My solution was to make a temporary V-block out of a two by four clamped to some plywood that was in turn clamped to my drill press table. This made the drilling a breeze and all the holes lined up just right. I then used the drilled holes in the pipe as the template for marking drill points on the two by four sides of the mount. The next step was to bolt the pipe to the two by fours and attach the two by six backbone to the whole unit. The two by six was cut just below the pivot point (the top bolt) and the cut end was attached above the pivot point. That way when the antenna tilted over the mast would be supported on the top and bottom and project out at 90 degrees. 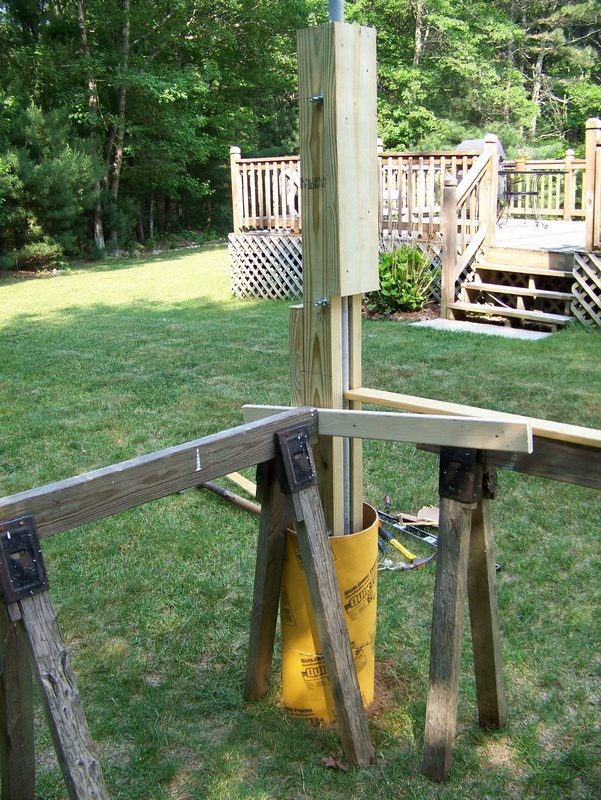 I chose a tilt height that matched the height of my sawhorses so that I would have a natural support for the antenna when it came down for maintenance. Of course, things did not work out exactly as I had planned. I drilled the holes in the two by fours on the wrong side (ignoring the notes I had placed right on the wood surface!). It worked out anyways, but I do have those holes just a bit close to the edge of the studs. It would have been better to have them more towards the center. I also was counting on digging my hole three feet deep. That would give me a total of five feet of mount above the ground. Unfortunately I was only able to get down about thirty inches due to massive rocks. The mount and pole were centered in the hole and cement was poured around them into a form. 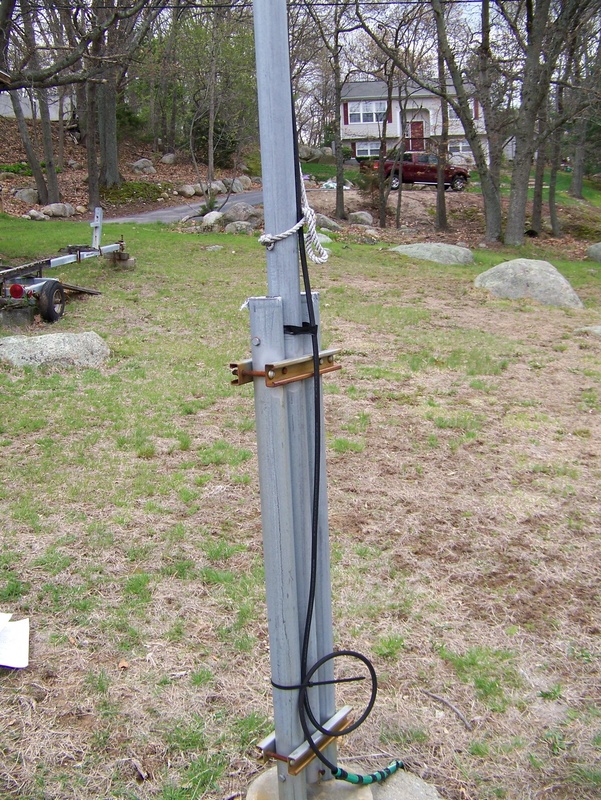 I also stuck an old ½” four foot ground rod into the hole alongside the mount. It all seemed to work out well until I finally got around to mounting the antenna on it. The antenna had to be built next. The one major recommendation I have for building the antenna is to follow the instructions. Don’t think just because you did it before or know what has to go where you can just do what you want when you want. I made the mistake of deciding early on to thread the yellow feed line out of the hole on the side of the antenna lower section. I ended up having to back it out because you can’t get the insulators on AFTER threading the feed line. The insulators must go on the antenna first. Also you may find that the Titan instructions say that you are provided with “a 4’ length of Dacron with a ring terminal”. That is incorrect. The antenna comes with only 18” because 18” is more than what you need. The antenna went together very easily. It also attached to my mount without difficulty. The only problem I had was when I went to put on the 40 meter hoop. I could not reach the hoop mounts even with a step ladder. I had made the pipe mount too long (10’ total). The only solution was to take the antenna down and cut off three feet of the mounting pipe. I didn’t trust my mount so I tried to tilt it down using a rope to lower it. No good! The mount and antenna twisted a bit, I almost killed my wife who was there to guide the antenna to the saw horses, and I managed to slightly crack the cement mount. All you have to do is to trust the tilt. Walk it down alone and it works with very little effort. Likewise for putting it back up. I found that I was able to do this with very little effort and maximum control. The only other glitch I had was with the coaxial cable connection. My soldering job worked the first day (great SWR on every band) but by the second day something was wrong. I found out that there was a short between the center terminal and shell of the connector I had soldered onto the antenna. I then put on a new connector and did it right. The next job will be to lower the Titan for minor adjustments of various elements to further reduce the SWR. Then I have to decide on a permanent method for getting the cable into the house and making a proper station ground. But then, this is the kind of stuff I like and it is way more satisfying than Internet communications. 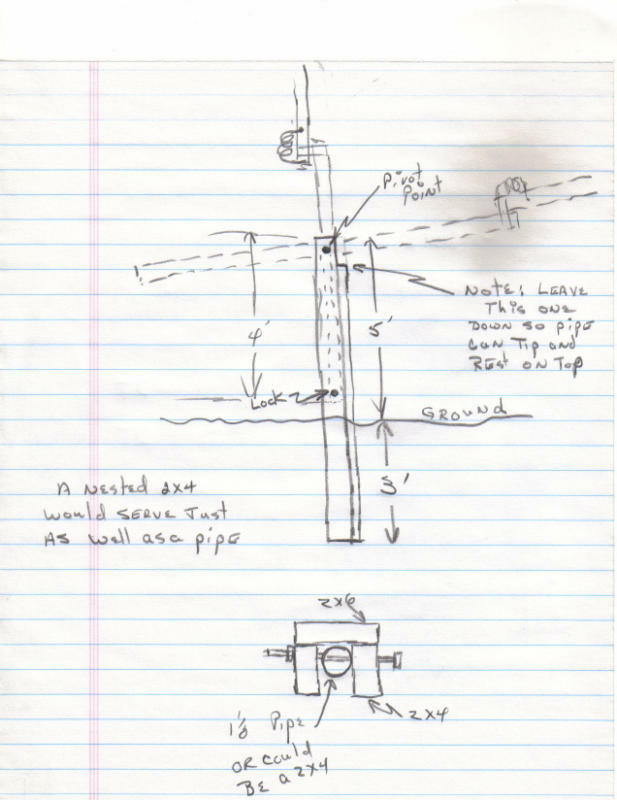 Copy of original plan proposed by CapnMike on the Gap Antenna Yahoo Group. Click to enlarge. 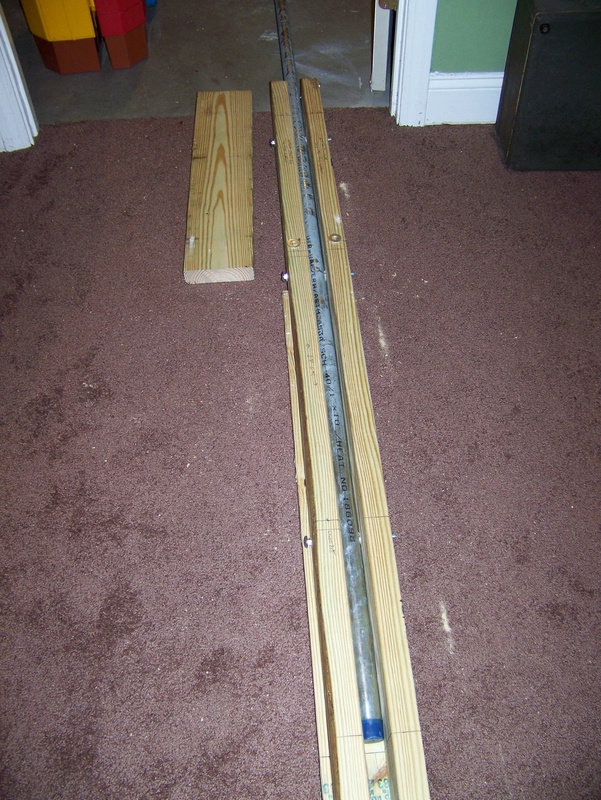 The total cost of the mount, excluding the steel pipe which is also required for any available commercial mount, was under $20.00. Just for comparison, if you look below you will see how my antenna was mounted at our other house. I did not use a tilt mount. The mounting pipe (painted black steel) was inserted into a PVC pipe. 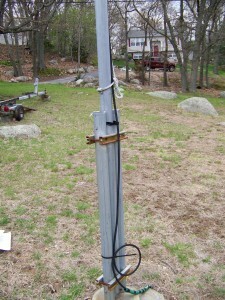 The entire mount had to be lifted out of the pipe so as to take the antenna down. This was impossible to do with only one person and rather difficult with two. I do not recommend that method. 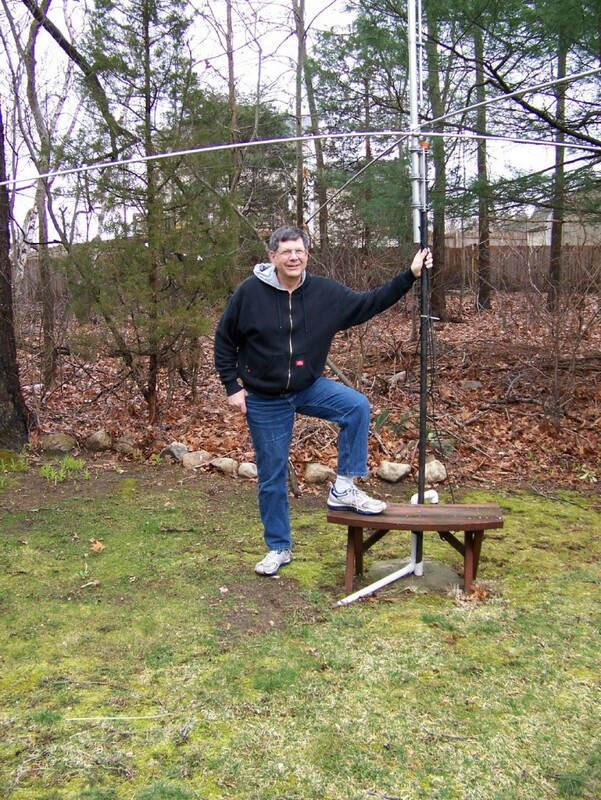 This entry was posted in Occasional Commentary, Radio: Amateur & Broadcast and tagged amateur, antenna, dx, gap, ham, hamcity, kb1awv, mount, plan, radio, tilt, titan, vertical. Bookmark the permalink. Dave .. thanks for checking out the link and for the nice comment. If you need any details, just ask. I hope to get a few more ham-related articles up here eventually. Nowshad / Flickermaan : Thanks for the comment. If you need any more details, let me know. I used this antenna today and made contacts to Ukraine, Germany, and Sweden. It works well. Ken, I have moved to a new qth and I will be installing my 4 year old Titan DX. I plan to use your great looking setup and wondered if you have any improvements since your posted story? Thanks for the nice comment, Lynn. Make the holes for the support bolts about 1/8-1/4″ oversize and it will be easier to insert and remove them. Try the bolts without the wingnuts. You should find it is just as sturdy. Popping out the bolts tends to strip the threads anyways (suggestion above may help that). You may want to coil a bit of chicken wire in the hole before pouring the cement. When lowering the antenna jus walk it down with hands over head rather than trying to lower with a rope on the back end. If you are healthy you won’t have any trouble. Use brand new commercial coax with pre-soldered connectors for lead in. Bury the coax ; don’t bother with conduit. 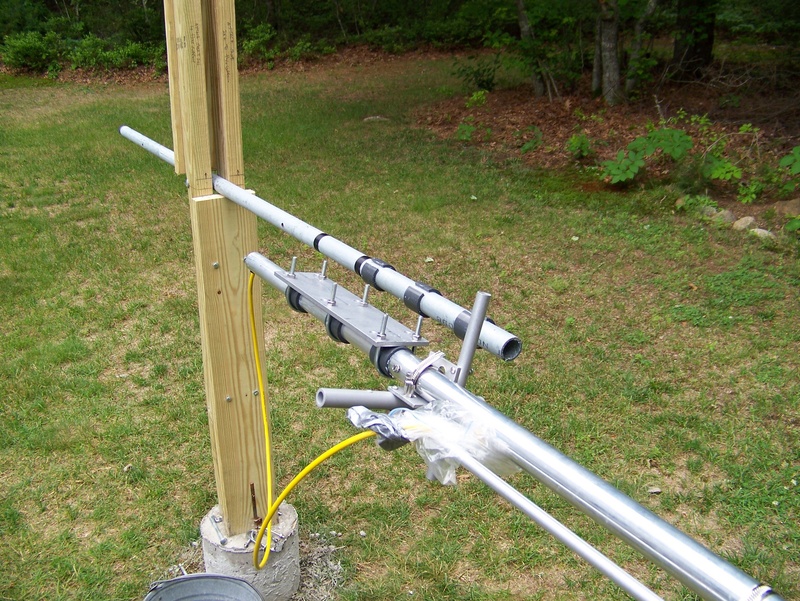 Make a balun coil shortly after coax leaves the antenna to help remove RF from the shack. Do a real good job of weather proofing the connection to the lead in (overdo it). That’s all I can think of. As you can see most of my problems originate with getting the signal into the house. Thanks for commenting. You inherited a good antenna and I think you will like it. I will soon be installing a vertical much like the Gap Titan. I’m interested in the mount you built, but can’t find the pencil sketch by Mike (WB9L). Can you provide that or tell me where to find it? John: It used to be in the file section of the Gap Yahoo Group. If I can’t find it there I will try to find a saved copy and send you one. DX. I’m a new ham , using a G5RV. It works but sometimes cant quite pick up and reach out. I intend to guy because of icing here in NJ . I’m going to try to copy the flagpole mount system you demonstrate. John, you have an excellent antenna. Follow the assembly instructions to the letter. Do not attempt to ‘skip ahead’. That will get you in trouble as it did for me and also a friend. Also, work alone during assembly. That way you are less likely to make any mistakes. You should be able to do the entire job with no help at all. Lifting and lowering the antenna on the mount described in my post is easy for one person in decent health. I am 68 years old and can do it. If you have any problems with dimensions, etc. for the flagpole mount just ask me. I’ll go out and take measurements that you may require. Also, be careful to leave plenty of slack at the point where the yellow coax exits the lower part of the mast. You don’t want a short length there to hang things up when you lower the antenna. Good luck and thanks for the comment. I just erected the Gap Titan, but I also used their folding ground mount which was pretty straightforward. Uk.dimg was also straightforward…..I took my time and I’d read the instructions several times first. I lowered it and double checked everything… and all seems ok. I can’t get hold of Gap Antennaks and my retailer….a ham specialist…is scratching his head. Any suggestions? It may be as simple as my soldering at the plug. But I can’t see how to actually test anything else. 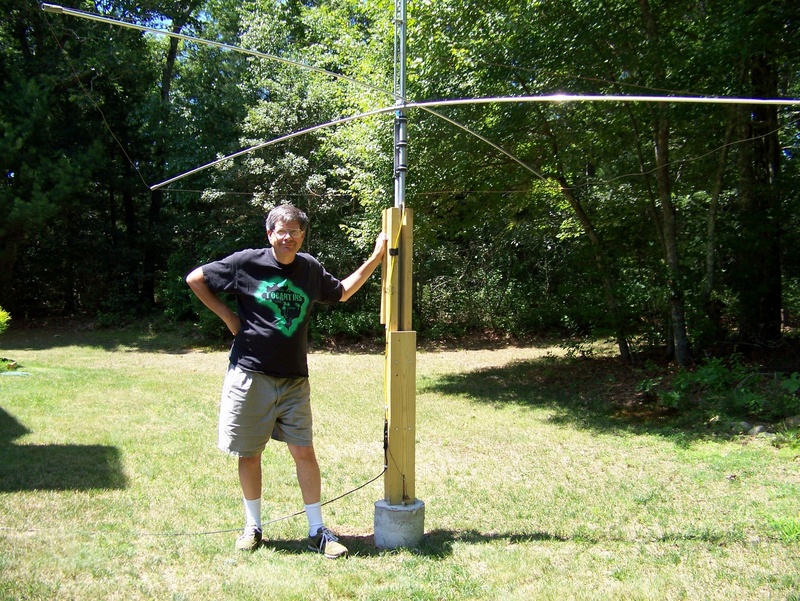 My friend, W1KEN, also has the Gap Titan DX antenna. He has talked with the men at Gap many times and they have been very helpful. I sent him and email and copied it to you also. I asked Ken to send you a list of the best telephone numbers to use and the best time to call Gap. They are in Florida, USA. My suggestions: Use a totally different coax cable to connect to the antenna just to see if something is wrong with the one your are using. If the results are the same then you have to look at the construction of the antenna. One common problem is the exit point for the yellow cable and connector at the bottom of the antenna. The cable MUST make a 90 degree turn at the bottom of the mast and exit that little hole. After it leave the hole is when you need to solder on your connector. Did you solder both the center connector and the outside shield? It usually takes a hot soldering iron (100 watts or more) to solder the shield to the outer shell of the connector. There are many other possible areas where small mistakes can have a big effect. I would go over the entire assembly again. If you don’t get anywhere you do need to call the factory repeatedly until you get someone or send them an email. Keep trying. Hopefully my friend will be able to help connect you with them. He lives in Florida and has visited the factory several times.